The MVP doesn’t go to the “most valuable player” so much as to the player everyone feels most comfortable picking as the MVP. That’s why Steph Curry is currently a 1-4 favorite in Vegas to win it. Nobody outside of Houston can get mad if Steph wins the award. He’s the best player on the best team in the league. He is beloved by teammates and opponents. His defense is better than ever, he’s the catalyst for the best offense in the league, and at 27 years old, he’s put together the most incredible shooting season we’ve ever seen. The only problem is, he’s not the most valuable player in the league. Strip away the politics, and the answer to the MVP question comes down to semantics. Best player on the best team? Steph Curry. Most outstanding? Gotta be Westbrook. He’s averaged close to a triple-double for the better part of 2015, and nobody in the league has been more ridiculous on a nightly basis. Most valuable? That is James Harden. Dwight Howard has played 37 games, and Harden’s been running with Donatas Motiejunas, Patrick Beverley, and Trevor Ariza all year. 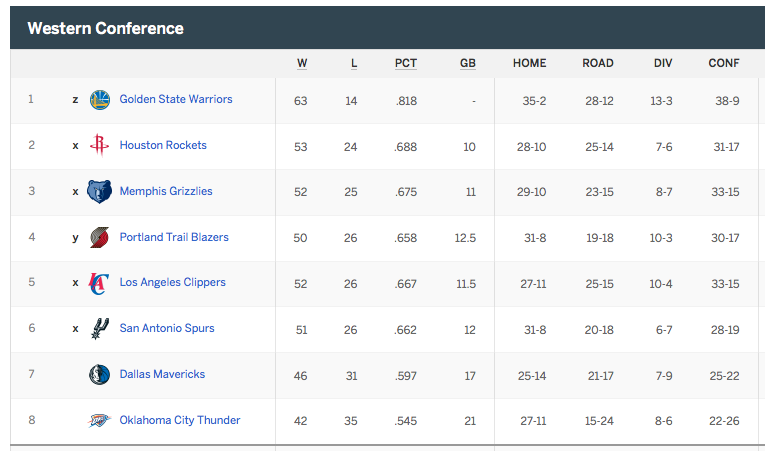 Now look at the standings. Curry and the loaded Warriors have been incredible at the top of the West, but Harden dragging this Rockets team to second place is more impressive. I don’t understand how anyone can pretend otherwise. It’s one thing to accept that Steph Curry will win MVP. But we all know Harden deserves it, right? This is where the MVP race goes in two different directions for me. My head says: Harden won’t have the votes, and that’s OK. People feel unseemly voting for Harden. I don’t even know if I could vote for Harden. He’s the most creative scorer on the planet, but he also turns basketball into a flopping Olympics. He has more made free throws (672) than anyone else has even attempted, and I’m not sure that’s a compliment. Beyond the genius-level passing and cold-blooded shooting, he spends 10 to 20 percent of Rockets possessions hurling himself into the defense in search of a bailout call. It’s jarring to watch. It feels wrong when it works. And it’s impossible to shake. That 10 to 20 percent is what people remember from his games. Rewarding that kind of player feels wrong. Rewarding Curry and this Warriors season feels right. That’s why the MVP race is pretty much over. My heart says: I watched the MVP during Thunder-Rockets on Sunday. Those were two teams that have each been relying on one superstar for the better part of the season. The Thunder looked exhausted, wheezing toward the finish line, clinging to a one-game lead over the Pelicans for the final playoff spot in the West. The Rockets? With four minutes left, it was a one-point game when Harden scored on a drive. On the next possession, he found Josh Smith for a layup. Then he buried two straight 3s. Then he grabbed an offensive rebound and a midrange jumper. That sequence gave the Rockets a seven-point lead and all but ended the game. Harden finished with 41, six boards, and six assists. This is how Houston’s entire season has gone. The team has just enough spare parts to keep it close, and then Harden shuts the door and the Rockets win. It’s not supposed to work like that. Especially not in this year’s West. The Pelicans and the Thunder are battling for the eighth seed because spare parts and one great player aren’t enough. Head: Curry still makes the most sense. He doesn’t piss anyone off, and if anything, he’s underappreciated. He’s Steve Nash and Russell Westbrook at the same time. Not only does his passing make the entire offense work, but the terror he inspires across any defense also frees up his teammates. He’s more than a great player on a great team. He’s the one player who takes everyone else from good to great. If that’s not value, what is? Heart: All of that is true. Also true: If you put James Harden in Golden State with Steve Kerr, the Warriors are just as dominant. Put Harden with Klay Thompson, Draymond Green, Andrew Bogut, and Andre Iguodala, that team will win 55-65 games. If you put Steph Curry with Ariza and Motiejunas, that team is battling for the eighth seed alongside New Orleans and OKC. These are stupid hypotheticals that can never be proven. If we’re not going to play out stupid hypotheticals for this totally subjective award, then why not just give the MVP to the player with the highest PER every year? You want stats to bring this back to earth? Harden is currently leading the league in Wins Above Replacement, win shares, and offensive real plus-minus. You can make the statistical case for Curry as easily as you can for Harden. Curry is leading in overall real-plus minus, he’s got a higher PER than Harden, and even while taking eight 3s every game, he’s right on the cusp of a 50-40-90 season. Since the All-Star break, he’s shooting 51 percent from beyond the arc. Want more stats? The MVP question is about semantics, not statistics — best player, most valuable, best stats, best team, etc. Any MVP candidate has to have a blend of everything. It would be too boring to give it to the best player every year. In that case, LeBron, Shaq, and Jordan would own the past 20 MVPs, give or take a few seasons. Team success should matter, too. It would feel wrong, for instance, to crown a player who might not even make the playoffs. Consistency for 82 games is part of it, and individual ridiculousness should also be just as important as winning. But shame aside, some truths are too obvious to ignore. What’s happened with the Rockets is more incredible than anything else in the league this year. There’s only one difference between Houston’s roster and the Sacramento Kings, and that is James Harden. Does Kevin McHale get no credit? What about the Moreyball BS that allows the Rockets to game the system with 3s and free throws every night? What about the Rockets defense that has been top 10 all year? Harden’s not the only reason this team is good. But they would be awful without him. Instead, they are the most amazing second-place finisher we’ve seen in a decade. What he’s done this year is the closest thing we’ve ever seen to etching an MVP campaign into the side of a mountain. And his team is still 10 games behind Curry. Look, winning should absolutely matter in any MVP conversation. It’s just amazing that everyone’s pretending that argument helps Curry more than Harden. The Rockets should be in the gutter right now. The MVP is the face of the league. The face of the league can’t be someone whose entire game plan relies on officials. Even if Curry and Harden are dead even, that’s the tiebreaker. I don’t have a problem with Curry winning. Years from now, we’ll look back and nod when we see his name etched into Wikipedia immortality. We’ll say, “Ah, right. That was the year the Warriors turned the league upside down.” It will make sense. It just doesn’t make sense right now. These two aren’t actually dead even. Deep down, we all know it. Once you weed through all the semantics, a definition of “most valuable” becomes clear. This award should go to the player who made the biggest difference on one of the best teams in the league. Then we can all agree the MVP is James Harden. And Steph Curry is going to win it.